Eagles fans at the Eagles public practice on August 11 at Lincoln Financial Field. Two weeks from today — that's right, two weeks — will be the first football Sunday of the 2018 NFL season, and odds are you can't wait for it to arrive either. 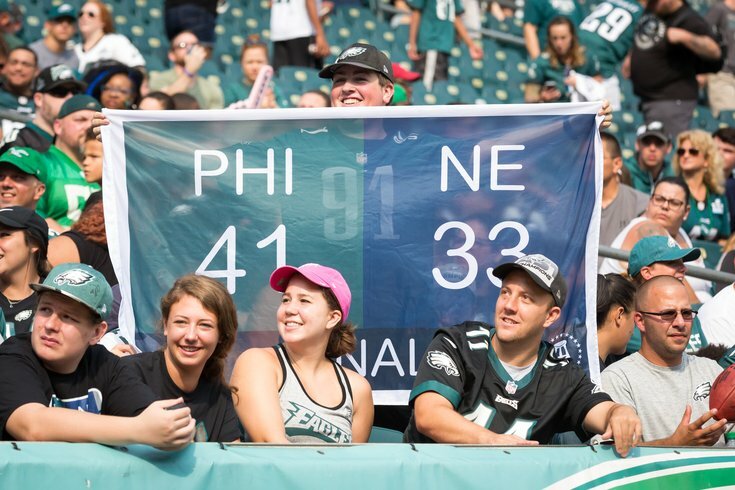 Luckily for Eagles fans, that wait will be a bit shorter, as the Birds open the season that Thursday night against the Falcons. There's still a preseason game to be played, but that's more or less meaningless unless you care deeply about the 52nd and 53 guys on the roster. Prior to practice on Sunday, however, Eagles head coach Doug Pederson wasn't yet ready to talk about the season opener against Atlanta, especially not about his quarterback situation (more on that in minute). We're going to take the opposite approach in today's What They're Saying by not only skipping over the preseason finale, but the entire regular season and conference playoffs as well — because why not? — and jumping right to the Super Bowl. As we previously mentioned, Doug Pederson has had enough of your Carson Wentz questions — not that we'll stop asking or anything — and he made that clear during his press conference on Sunday. Speaking to the media Sunday, he was uncharacteristically terse in his responses and let his frustration show after a follow-up question related to the process of evaluating Wentz, who has yet to be cleared medically for contact. "I don't know how many times I can answer this question," he said after a long pause and a laugh. "When they clear him, he'll be cleared. I'm not going to put myself in a box, I'm not going to put my quarterback in a box. I'm not going to do that. And I'm not going to go on a limb and I'm not going to say that. So either ask it a different way or otherwise you're going to get the same answer." As our own Jimmy Kempski pointed out earlier in the day, perhaps there's a reason Pederson doesn't want to talk about it. And of course, nobody can touch the QB in practice anyway, so "not being cleared for contact" doesn't impede his ability to participate in practice with the team in any way whatsoever. Jimmy also wrote on Sunday about the importance of having Wentz back for the season opener, and you can read all about that here: Eagles' Week 1 game is kind of a big deal and they could really use Carson Wentz for it. Speaking of the Eagles' quarterback situation — and the importance of getting Wentz back — the clearest indication that the team needs its starter to return came on Thursday night against Cleveland (and a week prior against the Patriots). As disappointing as Foles’ preseason has been, it should also serve as a reminder that he was never brought in to be the franchise quarterback in the first place. He’s a tremendous talent capable of playing well in spurts, but he isn’t built to carry the fate of an entire team on his back for a sustained period of time. 1. At 32 years old and in his 10th NFL season, Wallace has hit the veteran wall. He only caught one short pass in the preseason — a meaningless three-yarder from Nick Foles in Cleveland Thursday night — and showed no sign of the big-play receiver who’s averaged 15 yards per catch throughout his career. A month ago, Jordan Mailata had never played in a football game of any kind. Now, the former rugby star is drawing praise from all over for his growth since being drafted by the Eagles in the seventh round. First, there's this clip from Brian Baldinger, who knows a thing or two about offensive linemen — he did play 11 seasons in the NFL after all. But this may be the highest praise of all, and it comes from scout Tommy Lawlor, who compared Mailata to none other than future hall of famer Jason Peters. This dude looked completely lost against the Steelers. Two weeks later, he looks like a veteran OT. Watching him…the combination of size and athleticism…reminded me of Jason Peters. And I don’t say that lightly. Peters is a freak in his own right and has a shot to be in the Hall of Fame. Mailata has incredible potential. He just might be your starting LT in 2019.